For hotel owners and operators, there are many reasons to be optimistic about what is in store for 2014. We are moving into this year with a sense of stability and relative certainty in the industry. The consensus from industry analysts and observers is that revenue per available room will continue to see positive growth in 2014. There are good reasons to believe we will continue to see a slow uptick in rate, even if occupancy begins to level off as some are predicting. While questions remain—the looming uncertainty surrounding the implementation of the Affordable Care Act being perhaps the most significant—the last lingering ripples from the recession are fading, and hotel professionals are generally budgeting positively and anticipating a profitable and productive year. Successful hotel professionals understand, however, that a general optimistic forecast is no reason to let management standards slide, or to be any less vigilant about the practices that distinguish a well-run property from an underachieving asset. This is precisely the time when you should be redoubling your commitment to proven management techniques. In a cyclical industry, experienced hoteliers know all too well that you have to, as the old saying goes, “make hay while the sun shines.” There are opportunities now to push rate and to maximize the potential of your property that will not exist in less-prosperous times. 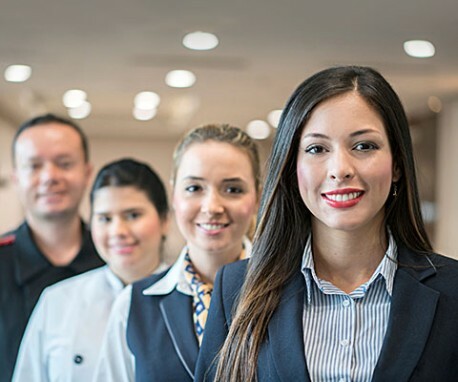 With that in mind, and the prospects of a new year and new opportunities stretching out before us, here are a few reminders of some of the most important hotel management basics. Think of them as your New Year’s resolutions for 2014. 1. Take your budget seriously . Far too many hoteliers engage in an extensive and detailed budgeting process at the end of the year and then promptly forget about it the moment the calendar page is turned from December to January. It is important not only to make sure you are remaining within the parameters of your budgetary framework but also to evaluate whether your budget is enabling you to optimize segment production and segment-mix targets. Your marketing plan is no good sitting on the shelf. It has to be something you live. It can’t just be an aspirational document or a conceptual strategy; it has to be an operational reality. If you have taken the time and invested the resources in developing a comprehensive marketing plan for your property, remember to follow through. Track the success and effectiveness of that plan throughout the year by using detailed metrics and analytics, and be willing to tweak it if necessary as your numbers evolve. It is imperative to consistently reinvest in your property to remain competitive and relevant in the marketplace. Regular maintenance and upkeep and a willingness to address capital issues promptly ensures there are no safety issues, brand standards are being maintained and small problems do not metastasize into costly and consequential liabilities. Also, it ensures your grounds and facilities are an appealing asset for your hotel. This is an important contribution to a positive and memorable guest experience. In operations and sales there needs to be a focus during 2014 on ways to retain key staff members while constantly looking to improve service levels through training and adding quality new team members through attrition. The objectives and strategies at the property must be clearly communicated to the team if you are to expect proper execution and results. Consistent communication is one of the most important ways to address emerging occupancy trends and to get out ahead of small problems before they become significant issues. The adage “trust but verify” applies here. It is important to trust your management team, but the best way to affirm trust is to set up regular meetings and establish a reporting structure that provides detailed information on a weekly and monthly basis—and periodically review that information in the context of annual goals. In 2014, resolve to be a rate leader and push rates as best you can (without pushing yourself outside of the market). Effective and sophisticated channel management can help greatly in this regard. Be analytical and tactical with respect to rate categories and identifying opportunities to increase rates incrementally. Helping to push a rate recovery takes leadership and initiative, and a willingness to do what is right for your property without excessive regard for what other hoteliers are doing. as a unique prospect and carefully analyzed based on your hotel’s key decision points—hotel demand, room-revenue contribution, food-andbeverage contribution, etc. You don’t want to have any regrets about a missed opportunity to improve your hotel’s future profitability. The beginning of a new year is a great time to review your overall revenue-management structure and to ensure that you have a sophisticated and comprehensive revenue-management strategy in place. From procedural details, such as daily meetings and market intelligence review sessions, to bigpicture goals and periodic market and demand analyses, optimizing revenue management and maximizing rate opportunities is not only about having a process in place, but also about regular and rigorous data gathering and the ability to act on that information. The revenue-management team and the sales-and-marketing team must be aligned and focused. Too often they can become separate silos and not united toward the same goal. Revenue management should be viewed as an extension of the marketing team working in conjunction to implement channel management strategies effectively and push into higher yielding segments. A joint focus allows for greater market penetration and an ability to attack multiple market segments simultaneously, initiating global strategies that lead to stealing market share and exceeding budgetary goals. While it can be difficult to look beyond the next 12 months, one of your management resolutions should be to think critically about existing and emerging issues in a larger and more longterm context. Online travel agencies are not going away, and having a strategy to deal with each OTA is an important part of your property’s longterm plan for success. Emerging and influential demographics, such as millennials, continue to loom larger on the industry landscape. Resolving to understand and address their priorities and preferences will go a long way toward positioning your property for success not only in 2014, but for many years to come. Get directly involved in an industry association or encourage your hotel staff to become involved in the local community. The most effective and honest involvement is to address issues that fall within the realm of your business. Giving back can do wonders for personal and team morale while making you a valued and trusted member of your local community. Without a doubt it will lead to further opportunities for you, both personally and professionally.